Reminiscent of Indiana Jones’ adventures, Hugh Pope’s account of his personal growth as a journalist in the Middle East is an epic book for anyone whose career interests have been driven by the mission of accurately representing the Middle East to Western observers. Honest and light-hearted, Dining with Al-Qaeda is more an autobiography than a historical or political account of Pope’s region of expertise. Although this is not to imply that the book is without depth. On the contrary, in framing the political and socio-economic characteristics of the region around his experiences Hugh Pope manages to create what most educators aspire to do in a class. Teach and inspire, without having their students notice. Taking you from his days as a student of Arabic and Persian at Oxford, to his days as a Middle East correspondent for some of the most well-known Newspapers in the West, Pope manages to traverse the region more times than one could imagine. It is in this way that he provides his reader the type of exposure to the numerous countries that make up the Middle East in a way that most other books on the region cannot. The essays that comprise his book may at first seem divided by space and time, but in the end comprise a comprehensive patchwork of the region ranging from post-revolutionary Iran to post-invasion Iraq. Most impressively however was how Pope managed to be present at every one of the most pivotal moment’s of the region’s history. In his accounts, Pope does not limit himself to the factual accounts you could read in the media or a guide book, but rather explains countries and their histories as he experienced them at the time. Instead, the aims of his book go beyond explaining the cultural encounters that one well-educated Westerner might have in his meetings with terrorists, officials, and women of a region that tends to fascinate. Rather, Hugh Pope embraces his journalistic training to expose the shortcomings and advantages that journalism itself has had on the region. Although slightly disenchanting to those wishing to follow in his footsteps, Pope makes important strides in highlighting two issues with enormous effects on the relationship between journalism and policy-making. Pope eloquently argues that despite the ethics of the most prestigious journals in the West, obstacles stand in the way of presenting the Middle East accurately. The preferences of editors, prevailing public opinions on the Middle East—all of these issues attenuate the message that journalists on the ground intend to get through to their readers. The most notable example Pope addresses is that of the Arab-Israeli conflict, which apparently was not news unless some prospect of peace could be incorporated into the journalist’s account. Pope thus demonstrates that despite the best intentions of journalists, at the end of the day, front page news is inhibited in a way that reduces its intended impact. On a positive note, however, Pope takes advantage of this book to set the record straight. He tells not only of the obstacles but overcomes them giving its reader the better-late-than-never accounts. Combined with a first-person narrative, these insider’s views create a complicity between Pope and his reader that makes Dining With Al-Qaeda a pleasant and informative read. Beyond the politics of Western journalism, there is also an important emotional dimension to Pope’s latest book. A student of the culture and languages of the Middle East, it is clearly difficult for Pope when instead of being acknowledged as an objective investigator, he is perceived of as a spy. Beyond the degree to which he is accepted in the region, Pope also brings to light the more serious risks journalism implies. As a reader, one often tends to forget the dangers journalists in the Middle East expose themselves to in order to bring home accurate and interesting accounts. Pope’s ability to connect his reader to the day-to-day aspects of his profession is impressive. It is also a tribute to the colleagues and friends he lost in the field. 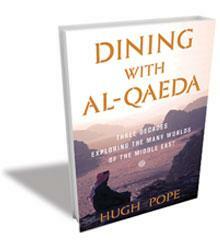 Dining With Al-Qaeda attests the ability of this journalist to speak to his audience. Despite the difficulty of explaining such a complex region during three of its most tumultuous decades, Pope succeeds in every one of the aims his book sets out to accomplish. Although not a historical or political reference work, Pope’s latest book is certainly a contribution to the study of the Middle East, if only for the moving and unique perspective his patchwork of essays provides.